The Lock-a-Draw draw keep is made entirely of black anodized aluminum and stainless steel. All the moving parts are stainless steel for durability and corrosion resistance. 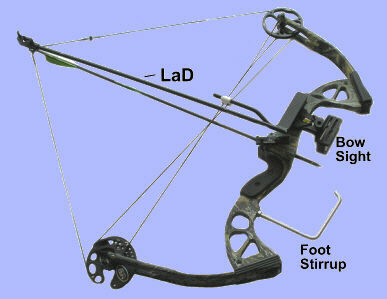 It comes with a special bow mounted quiver that holds the Lock-a-Draw as well as arrows. Different rods are supplied to fit right and left hand bows. The picture shows the four pieces that make up the Lock-a-Draw and quiver package. Complete instructions are included with the unit. The rod length allows for draw lengths of up to 32 inches and is cut off to match your draw length. The release is glued on the rod with 5 minute epoxy glue. 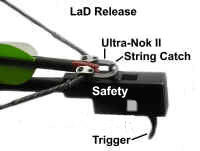 To tune the Lock-a-Draw the rod is bent at the mounting plate to bring the string catch to the bow string's nocking point, paper tuning is used to determine the direction to bend the rod..
have the industry standard holes for mounting a quiver, the Lock-a-Draw will fit any bow with a standard sight. A few bows, mainly Hoyt bows, may require a 1/4" spacer under the quiver mounting block if the cable guard is in the way of the quiver mounting block. Either a 1"x2" block of wood or aluminum (or any other solid material) works fine. The spacer is not detrimental to either the tuning or accuracy. The Lock-a-Draw mounting plate has the same pin structure as the quiver. The quiver is removed with a twist and the Lock-a-Draw goes on the quiver mounting block with a twist just as the quiver did. Your bow is now a vertical crossbow, cocked with hands and feet. To draw the bow from a standing position a foot stirrup is needed. This replaces the stabilizer and screws into the stabi- lizer hole. Holding the bow by the string with both hands straddling the nocking point, place the bow on the ground and step on the stirrup with your foot (not just your toe). 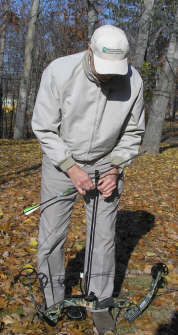 Cross your thumbs under the Lock-a-Draw rod and slide your thumbs along the rod guiding the nocking point to the string catch as you draw the bow. 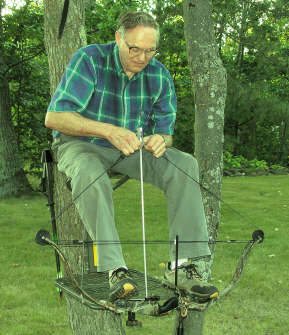 When hunting from a tree stand the stabilizer can be reinstalled and the bow drawn with both hands and feet from a sitting position as shown in the right hand photo.. I am the person on the left drawing a 70 lb bow. I could not draw that same bow in the traditional manner when it was set at 50 lbs.